영역별 연습문제 등으로 구성되어 있어서 새로운 단어를 이해하고, 기억하고, 사용하는 데 도움이 됩니다. 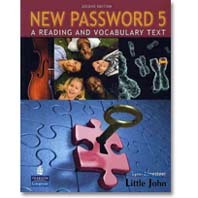 Password 시리즈는 기존의 3단계에서 5단계로 구성되어 사용 빈도가 높은 어휘와 지문 수를 증가시켰다. 교재 지문은 2,000어휘를 습득할 수 있다. ㆍSystematic Approach은 중요한 단어와 구를 학습하는 데 도움이 된다. The popular Password series now offers expanded instruction for your beginning and intermediate students! 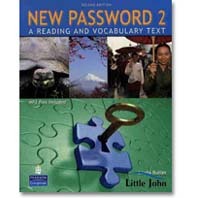 Designed to help learners of English develop their reading skills and expand their vocabularies,New Password’s theme-based units include a mix of engaging nonfiction reading passages, skill-development activities, and exercises to help students understand, remember, and use new words. With this new edition, thePassword series expands from three levels to five, which increases the number of readings as well as the coverage of high-frequency vocabulary. When used as a series, these texts help students reach the 2,000-word vocabulary level, where corpus-based research has shown most can begin to read unadapted texts. 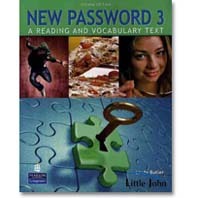 ㆍStudent Book with carefully recycled high-frequency vocabulary, activities that highlight collocations and word grammar, discussion and writing activities, vocabulary self-tests, and unit wrap-ups that help students review vocabulary and practice dictionary skills. ㆍAudio CDs to aid comprehension, retention, and pronunciation. ㆍTeacher’s Manual with Tests that features answer keys for all student exercises, unit tests, and Quick Oral Review for vocabulary drills. ㆍPre-reading tasks get students thinking about the subject by drawing out opinions and relevant experience. 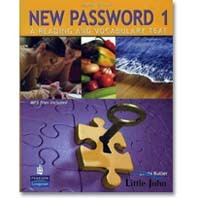 ㆍQuick Comprehension Check true-false exercises at the end of each reading check general understanding. ㆍPost-reading exercises help strengthen skills like scanning, summarizing, discussion, and writing. 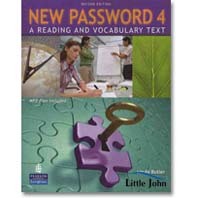 ㆍExpansion activities include word families and collocations, word puzzles, and building dictionary skills. Unit 2: I'm Hungry! Are You?